Cal Poly welcomes prospective students, parents, alumni and friends to campus for Open House from April 11-13, 2019! 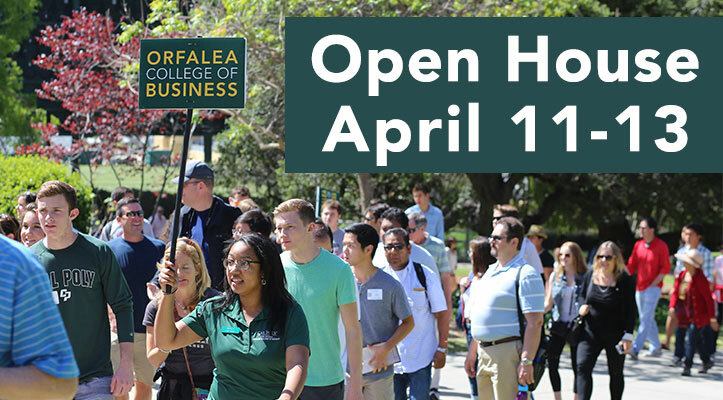 The Orfalea College of Business is proud to host events throughout the week that will give prospective students and supporters an in-depth perspective on the Learn by Doing education the college provides. Description: We are thrilled to welcome you to Open House and start your experience today with giving a high level overview of what you can except as an incoming OCOB student. Through this Welcome Session, you’ll learn about: who we are, what we do, how we excel, and where we go! This session will be facilitated by two Orfalea Student Leaders, with a virtual welcome from Scott Dawson, Dean, an overview of Student Services by Amy Carter, Assistant Dean for Student Success, and a keynote from Kimberly Van Wert, Partner Performance & Governance at Google. Description: Attend the Orfalea Student Experience Panel to hear directly from current Orfalea students on a variety of topics including: building community on campus, developing career-readiness skills, expanding their global mindset through international experiences, applying learn by doing through senior projects, and pursuing leadership experiences. Description: Orfalea’s Information Fair will encompass a variety of all areas that make Orfalea who we are! Attend and meet student leaders, staff, area chairs, and faculty. You can expect to learn more about the curriculum of each OCOB major, engage with faculty across all majors and concentrations, and connect with a variety of programs that influence the student experience, including Orfalea’s: Peer Mentoring Program, Multicultural Business Program, Tutoring Program, Career-Readiness Office, and Peer Advising. Description: Gain a comprehensive overview of the Orfalea College of Business, including unique qualities and history of the building. Description: Attend an informal gathering with Jean-Francois Coget, Associate Dean of Academic Programs, Katelyn O’Brien, Assistant Director of Student Services, and Orfalea Student Leaders.